This Christmas, just like the last one, happily, I got a gift of a stack of thrift store baseball cards from my wife’s aunt. She also gave me four large microbrewery beers and a game called “Classic Baseball” that included about 50 cheaply produced 1989 baseball cards, a small cardboard game board in the shape of a baseball diamond, a die, and three Parcheesi-esque game pieces. There were no directions on how to play the game, but on the back of each card, below statistics that show the player’s 1988 output and his career totals, there are five trivia questions labeled S, D, T, HR, and R. After Christmas my wife used the cards to quiz me, and I stumbled along at a 50/50 pace at first and then, after polishing off most of the microbrews, I started to heat up. I came up with the correct answers for all the questions on the back of this Gregg Jefferies card, though I had to take a couple stabs at the third question before getting it right. S (T-F) Carl Yastrzemski appeared in at least 3000 M.L. games. T Who was the Career Strike Out King, prior to Reggie Jackson? HR Name the only M.L. player killed by a pitched ball? R Dwight Gooden is sometimes referred to as whom? I don’t know what to do with the game board and die and game pieces, but the cards will be going into the shoebox with all my cards from my childhood. I like these new arrivals, as they throw light on a section of baseball history that is otherwise not represented in the box of cards that stopped growing in 1981. And even after I stopped worshipping the gods, I still relied on baseball to measure my life by. So seeing players from the late 1980s and early 1990s, which is where the players in the thrift store stacks from Aunt Celia are always from, brings back that time in my life, when I was edging into my twenties, leaving college, starting to see what the world had in store for me. Gregg Jefferies occupies a small but key place in my internal baseball-compassed map of the world. By the time I started living in New York, fresh out of college, in 1990, Jefferies (just a few months my senior) had already begun gathering blame for the flagging fortunes of the New York Mets. Jefferies had been drafted in the first round by the Mets in 1985, the same year the team arrived as a force in the National League, winning 98 games behind a young, talented core that seemed destined to lead the team to championship contention for years to come. The promise of the team arrived the following year, the Mets winning 108 games and a World Series title. That year, Jefferies, just 18 years old, blitzed the minors at the A and AA levels with a combined .353 batting average with 32 doubles, 11 triples, and 16 home runs in 125 games. He hit .367 in the minors the following year, earning a late-season cup of scorching coffee (3 hits in 6 at-bats) with the big club, and in 1988, the year depicted in this “Classic Baseball” card, he came up to the Mets in late August and sparked the team to a dominating 24-7 finish to the season by hitting .321 with 8 doubles, 2 triples, and 6 home runs in 29 games. The 20-year-old kept up the hot hitting in the playoffs, playing in all seven games of the team’s series loss to the Los Angeles Dodgers, in which he hit .333 with a .438 on-base percentage. Despite the loss, the future still seemed bright for the Mets, in large part because of the great expectations created by the young switch-hitter. As the would-be dynasty of the Mets began to unravel due to poor trades, drug problems, and aging, the spotlight of fan hopes for the team fell on Gregg Jefferies, and Gregg Jefferies proved to be something less than the sawed-off shotgun version of Mickey Mantle that he had first appeared to be. Unfortunately for him, the disappointment around his failure to meet nearly impossible expectations was compounded by his being something of a polar opposite of the Mets at their 1986 peak. Compared to those Mets, who collectively had spilled over with the volatile, abrasive, magnetic personality of a band of outlaws, Jefferies seemed almost robotic. Worse, his dogged pursuance of a metronomic consistency in his game came across as bordering on selfish, as if all he cared about was the health of his batting average and not about “doing the little things” it took to win. Also, he was well short of being a wizard with the glove, and his inability to put an ironclad claim on a fielding position added more marks against him in fans’ minds. As he bounced from position to position he kept supplanting the incumbent at the position, and it was almost as if he was an eraser, removing one player after another who had been on the 1986 team. I don’t think this is actually how it went down, i.e., that as he switched from position to position he sent one after another ’86 champ packing, but I’m pretty confident that I’m getting the general subjective view of Jefferies correct: he replaced the ’86 Mets. It was hard for Mets fans to look at Gregg Jefferies’ youthful, slightly pudgy face and his underwhelming batting average and not feel a little cheated. So by the time I got to New York City to start my adult life, Gregg Jefferies had become something of a human bad luck charm. If it had been colonial Salem, he probably would have been deemed a witch and tossed onto a bonfire. Nowadays such offenders are shipped to Kansas City. The following season the erstwhile future of the Mets returned to the National League, with the Cardinals, and hit his stride, vying for the 1993 N.L. batting title and hitting over .300 for three years in a row. He kicked around for a few more years beyond this admirable peak, and hung it up in 2000 with 1593 total hits and a .289 career batting average. (A few years later, he somehow even garnered two Hall of Fame votes.) But I’ll always remember him as a young guy who couldn’t get it together back when I was a young guy who also couldn’t get it together. You’d think I’d have thought fondly of him, or at least empathized with his plight, but I razzed him along with everyone else. 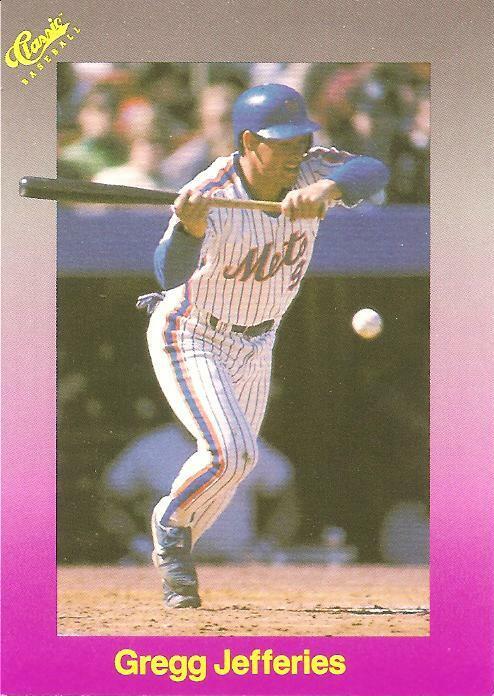 Even to this day I can’t help looking at this 1989 “Classic Baseball” card of him laying down a bunt and think that he is in the midst of a humiliating failure. In truth, the ball has probably already made contact with his bat, and he has ably carried out his task. But it just seems more fitting to think that the ball is still on its way from the pitcher, and that Jefferies has sorely miscalculated in his gyrations, and in the next moment the ball will punch him in the stomach and he will crumple to the dirt in a heap as mockery and derision rain down from the stands. You are currently browsing the archives for the Gregg Jefferies category.